For the sake of clarity, but without limitation, the Websites covered by these Terms are the following: RICARDO Cuisine , Mama Choka , Café RICARDO and the application RICARDO Magazine. PLEASE CAREFULLY READ ALL these Terms BEFORE USING THE WEBSITES. By agreeing to the Terms, or by using the Websites, you accept to be bound, without reserve or restriction, by the conditions and stipulations of the Terms. Access to and use of the Websites is subject to the full and unreserved compliance by these Terms. If you do not wish to be bound by these Terms or if you do not fully accept the Terms, you must abstain from using or accessing the Websites. Price. Prices are in Canadian dollars. Unless otherwise stated, the prices do not include applicable sales taxes. Any subscription or order, regardless of its origin, is payable in Canadian dollars. The prices include shipping and handling fees for deliveries in Canada only. To find out about our shipping and handling fees abroad, please contact the Subscription Service. Please note that for any delivery outside Canada, any customs fees and local taxes will be charged to the recipient. Payment. Payments for your purchases or subscription are made by Visa or MasterCard credit cards and are processed through the Moneris secure online payment system. You agree to pay the full cost and fees related to the purchased products, including the taxes and the shipping and handling fees, if any. You are solely responsible for the effective payment of the product purchased. In the event that your payment cannot be validated or processed, your order will not be delivered and the Business will have no obligation to process your order. The Business is not responsible for payment problems related to the operation of the Moneris secure online payment system. If you would prefer to subscribe to the Magazine by telephone or mail, please contact the Subscription Service. inability to deliver the product to the indicated delivery address. The Business may also require verifications or additional information before accepting any order. The Business will contact you in the event that all or parts of your order are canceled or to obtain additional information required for the acceptance of your order. Processing your order. The receipt of your first Magazine can take approximately four to six weeks. Cancellation of subscription to the Magazine. If you are not satisfied with your subscription to the Magazine, you can cancel it at any time by contacting our Subscription Service. When you cancel your subscription, thus terminating your original commitment, you are entitled to a refund equal to the lump-sum paid (including taxes), minus the unit price of the volumes that were sent to you prior to the cancellation date (including taxes). Any amount less than $ 10 will not be reimbursed. Note 2: The suggested unit price is the price, before taxes, that appears on the cover page of the Magazine, which if $ 7.99 as of September 2016. The Business cannot guarantee that the ordered products will be available, or that some of their information is up to date. In this event, your order will be refunded as soon as possible. Delivery. The Magazine is shipped from our distribution center by parcel service (Canada Post). We pay close attention that the best shipping method is chosen. For any delivery outside Canada, we always aim to use the delivery method that is most economical for you. The Business is not responsible for delays or clerical errors caused by you in the delivery address. Any damage to the Magazine delivered must be reported within 72 hours of delivery. To do so, please contact the Subscription Service. Once the 72-hour period lapses, the Magazine will be deemed to have been sent and received in perfect condition. SUBSCRIPTION SERVICE - RICARDO MEDIA INC.
Price. The prices appearing on the Café RICARDO Order Form are in Canadian dollars and exclude sales taxes, where applicable. Processing and Payment. For an order made using the Café RICARDO Order Form to be processed, the balance must be paid, online, by credit card (Visa or Master Card) using the payment module available to you during the purchase process. Store Pick-Up. All orders made via the Café RICARDO Order Form must be collected directly at Café RICARDO (310 A, d'Arran Street, Saint-Lambert, Quebec J4R 2T5) during opening hours. Final Sale. Since our products are perishable and mainly made-to-order, there will be no exchanges or refunds. Availability. The Business cannot guarantee that the products ordered will be available, or that some of their information is up-to-date. In this case, your order will be refunded as soon as possible. Display. Product pictures are for illustrative purposes only and accessories are not included. Food Safety. The Business cannot guarantee that the products do not contain traces of nuts and peanuts. To use certain features of the Websites, you may need, or will be given the opportunity, to create a user account (a “User Account”). To create a User Account, you must provide, for example, your first and last names, your e-mail address, country of residence and a password. Once registered, you may have to provide additional information to the Business in order to help us organize your profile and offer you a more personalized experience of the Websites. You are responsible for the protection of the confidentiality of your User Account and the password linked thereto. You shall immediately advise the Business of any unauthorized use of your User account or of any other form of security breach to avoid a potential fraudulent or unauthorized use of your User account. The Business is not responsible for any unauthorized use of your User Account, and you agree to bear all responsibility for any acts committed through your User Account, unless you close it or report abuse or fraudulent use thereof. For any request to close your User Account or to report any abuse or fraudulent use thereof, please refer to section 21 below to find our contact information. The Business reserves the right to suspend or close your User Account at any time, at its discretion and without prior notice. For example, but without limitation, the Business may suspend or close your User Account if you fail to comply with the Terms or if you use the Websites in a manner that is likely or would risk to harm the Business, cause it to incur liability, to disrupt the activities of the Websites or to disrupt the use of the Websites by third parties. The Websites may offer certain features that enable Users to contribute to the content of the Websites, namely to (i) evaluate and comment on recipes, (ii) evaluate and comment on the content published, (iii) annotate the recipes, (iv) create a personalized grocery list, and (v) create a daily menu (the “User Content” or “Your Content”). You retain the rights to your copyrighted content or information that you submit through the Websites and the Business represents that it will never claim to be the owner or the original author of Your Content. However, by submitting Your Content via the Websites, you grant the Business a royalty-free, perpetual, irrevocable, non-exclusive, unrestricted, transferable, sub-licensable worldwide license to Your Content for any purpose whatsoever (the “License”) and you waive all your moral rights to Your Content. Through this License, the Business may, without limitation, use, reproduce, store, adapt, translate, modify, create derivative works, transmit, distribute, perform in public and make available to the public, in any medium whatsoever, Your Content. acknowledge and agree that the Business shall not be held liable for any loss, damage or corruption of Your Content. Your Content is not used to promote or advertise services, products, websites or organizations other than the Business’ services, products, websites or organizations and is not a chain of letters or any other form of solicitation. Your Content is a reflection of your thoughts, your preferences, your tastes and, more generally, of your person. You must not imply that Your Content is endorsed by a third party unless expressly authorized to do so. You may not imply, suggest or pretend that the Business approves, shares or endorses Your Content, unless expressly authorized to do so. The Business may reject or withdraw any User Content at its sole and absolute discretion and without notice to the original author. The Business does not endorse or approve the User Content found on the Websites and accepts no liability and gives no warranty for said contents. Except for the User Content, any content created, developed, distributed, communicated, elaborated, generated or reproduced on the Websites (including texts, recipes, codes, illustrations, images and videos) as well as their selection, composition and arrangement (the “Content of the Business”) belongs to the Business or is licensed from third parties and may be protected by intellectual property laws, such as the Copyright Act (R.S.C., 1985, c. C-42). Where applicable, the Business reserves all of its rights with regards to the Content of the Business that it owns. Consequently, it is prohibited to copy, reproduce, modify, reformulate, edit, and more generally, use the elements that constitute the Content of the Business, in whole or in part, without the prior written consent of the Business. Notwithstanding the preceding paragraph, you may download, print and reproduce the Content of the Business for your own informational purposes provided that you agree to respect any and all copyright or other proprietary notices with respect to the Content of the Business, and that you cite the URL source of the Content of the Business. Certain names, words, titles, sentences, logos, designs, graphs, icons and trademarks displayed on the Websites may constitute trademarks, registered or not, of the Business or third parties. Although the Business may use under license certain trademarks of third parties, the display of third parties trademarks on the Websites shall neither imply any relationship or license between the Business and said third parties owning a given trademark, nor the approval or endorsement by the Business of the goods, services or activities of the owner of said trademark. Nothing contained on the Websites should be construed as granting you a license or right to use any logo, design or trademark of the Business or of any third party, without the prior written permission of the Business or of the third party owner of the given trademark. By using the Websites, and without limiting what is otherwise stated under these Terms, you agree (i) to respect all laws applicable to you in your home jurisdiction, (ii) to provide us with accurate and up-to-date information, and (iii) to use the Websites in a reasonable and responsible manner. use the Websites in way it is not intended to be used. If the Business has reasonable grounds to believe that you do not comply with the aforementioned obligations or any other obligation stipulated in the Terms, the Business can, at its sole and absolute discretion and without notice, suspend your right to use the Websites or restrict your access thereto in any other way the Business deems appropriate. Some links within the Websites may take you to other third party websites which are under the control or of the responsibility of the Business. The Business has no way to control these websites, and is not liable for, nor guarantees, the availability, reliability or the legality of these websites. The Business does not endorse or approve the content to which these websites allow access, and excludes all liability or guarantee in their regard. The User that accesses the websites does so at its own risk. The Business reserves its right to insert advertisement throughout the Websites, which can link to third party Websites. Under no circumstance does the Business approve, endorse, nor is liable for the ideas, opinions, products services or more generally the content displayed in the advertisements and on the third party websites to which they offer access. Any comment or suggestion related to the Websites, their functionalities, or the commercial activities in which the Business participates in or may participate in that you communicate to the Business may be used, adapted or implemented by the Business without any obligation to remunerate you or compensate you in any way. You agree that any comment, suggestion, idea or proposal related to the Websites, their functionalities, or the commercial activities in which the Business participates in that you submit to the Business (other than the User Content) (the “Material”) is non-confidential, non-proprietary, and may be disclosed, used, adapted or implemented by the Business without any obligation to remunerate you or compensate you in any way. as to the secure transmission or transmission without interception of communications through the Websites. To the full extent allowed by applicable law, in no event shall the Business and its officers, directors, employees, agents and their respective successors and assigns have any liability, whether based in contract (including any breach of an important obligation), these Terms, delict or tort (including negligence) or strict liability, for incidental, indirect, consequential, special, or punitive damages of any kind, or for an invasion of your privacy, loss of revenue or profits no matter the cause, loss of business or goodwill, loss or corruption of, or unauthorized access to, or disclosure of information or data or other financial loss arising out of or in connection with the use, performance, failure, or interruption of the Websites, whether foreseeable or not, and even if the Business had been advised of the possibility of such damages. In addition, the Business has no obligation to store the searches, preferences or any other data that you generate or save from time to time on the Websites and shall not be held liable for any loss or damage resulting from a loss of such data. Should you decide to visit or use a website linked to the Websites, materials, softwares or any goods or services available through a website linked to the Websites, you are doing so at your own risk. The Business is not responsible for the User Content that you generate on the Websites, or for the actions that you take or fail to take in connection with the Websites (your “Acts”). You agree that your Acts are your own responsibility and you acknowledge that you performed them knowingly. The Business will not be held liable for any breach of the Terms that you may have committed. Consequently, you shall defend the Business, its affiliates, parent company, officers, agents, representatives, directors, employees and business partners in the event that a legal proceeding is filed against the Business following a breach of the Terms that you, or any person having access to your User Account, may have committed. In any case, you agree to indemnify and hold harmless the Business, its affiliates, affiliated companies, directors, officers, agents, representatives, employees and business partners against any losses, obligations, claims, demands, damages, costs and expenses of any nature whatsoever, including reasonable legal fees incurred in connection with your Acts and the breach of the Terms, any law or the rights of a third party. These Terms are governed and interpreted by the laws of the province of Quebec and the laws of Canada applicable therein (without regard to conflicts of law principles). This paragraph does not apply to consumers of the province of Quebec (Canada) to whom Quebec’s Consumer Protection Act (chapter p-40.1) applies. You irrevocably agree and acknowledge the exclusive competence of courts under federal and provincial jurisdiction sitting in the judicial district of Montreal for any dispute which may arise in connection with the Terms or related thereto, elect domicile therein and waive any objection based on the lack of subject- matter jurisdiction or any claim based on the notion of forum non conveniens. Each provision of these Terms is separate and distinct and, if a provision of these Terms is held invalid, illegal or unenforceable, all other provisions will remain in full force and effect. A failure to act or delay in acting by the Business with respect to a non-performance, or the non-exercise of a right under these Terms will not operate as a waiver of that performance or of that right. The waiver of a right under these Terms by the Business will not be effective unless it is given in writing and is signed, in which case it will be effective in the specific instance and for the specific purpose given. You may not assign or delegate any right or obligation under these Terms without prior the consent of the Business. As the first version of the Terms was uploaded online on November 14, 2016 (the “Upload Date”), you agree and acknowledge that, where applicable, from the time you first accepted the Terms, any use, content generated and any act or omission in connection with the Websites that relates to a period prior to the Upload Date, is retroactively subject to these Terms. The Websites are a dynamic and evolving environment subject to change. The Business may review the Terms at its sole discretion by simply updating this page or pages where the provisions of the Terms to be changed are found. It is your responsibility to consult the Terms on a regular basis to become aware of any changes that may be made to them. Notwithstanding the foregoing, the Business shall notify the Users of any amendment to the Terms at least 30 days prior to its entry into force. If you do not agree with one or more changes to the Terms, you must cease all use of the Websites and close your User Account, if any. Continuing to use the Websites or not closing your User Account after the Business has published the changes will be equivalent to your acceptance of the changes to the Terms. CUSTOMER SERVICE - RICARDO MEDIA INC. In the case of the User: to the e-mail address provided to the Business through the User’s profile or otherwise. Such notice or communication will be deemed to have been given and received on the day it is actually delivered or sent (or, if that day is not a business day, on the following business day), unless it is delivered or sent after 4:30 p.m., in which case it will be deemed to have been given and received on the next business day. 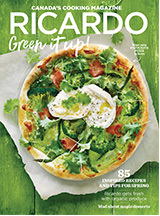 For questions regarding the RICARDO Magazine and the subscription to the RICARDO magazine, please contact us using the contact information found in article 3. For questions regarding the online ordering module of Café RICARDO, please contact us using the contact information found in article 4. Sections 4 (User Content), 10 (Idea Submissions), 11 (No Warranties), 12 (Limitation of Liability), 13 (Indemnity), 14 (Governing Law and Jurisdiction), 15 (Severability), 16 (Waiver) and 22 (Survival) shall survive any termination or expiration of this agreement.